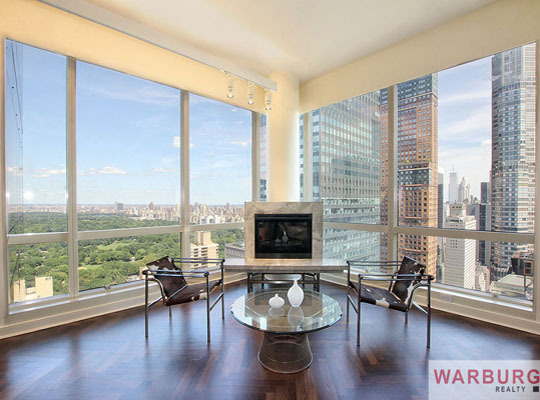 This spectacular 2 bedroom 2 bath apartment with a home office and unbelievable direct Central Park and city views is a luxury and location lover's dream. Dramatic panoramas and abundant light complement an expansive, meticulously-designed layout highlighted by 10' ceilings, floor to ceiling windows, herringbone African rosewood floor and marbleized and Venetian plaster accent walls. Other elegant contemporary finishes include new custom millwork, beautiful built-ins, Baldwin Estate door hardware, iGuzzini Italian lighting and premium-quality Lutron dimmers and light switches, a super white marble fireplace with built-in Dimplex firebox, spa-like baths with walls of white Calacatta marble, remote-controlled motorized blackout and solar shades.